Nearby are a number of restaurants and shops just a short walk away. 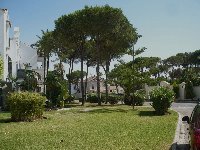 Nothing but a small strip of woodland separates the property from the beautiful but quiet beach, which also has two beach bar/restaurants within a short walk. Our penthouse apartment is not overlooked in any way- one side overlooks the lawns and pool, and the other looks out over the wooded estate towards the sea and mountains. 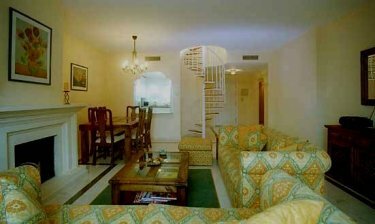 On the upper level is a furnished roof terrace reached from the living room by a spiral staircase- a great place for sunbathing or a drink while watching the sun set over the mountains, and you may even see Gibraltar across the sea on a clear day. The main level comprises a very spacious and fully equipped living area (video, CD player, UK satellite TV etc) with seating and dining for six, and a fireplace. 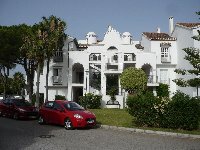 There is a large fully fitted marble kitchen with all usual appliances including dishwasher, plus two large bedrooms. One bedroom has a king size double bed and the other has two singles, and each bedroom has it�s own small private Juliet balcony with pleasant views of woodland and mountains, and each also has an en suite marble bathroom. For outdoor eating, a fully furnished terrace opens off the living area, with views over the nearby pool and lawns. 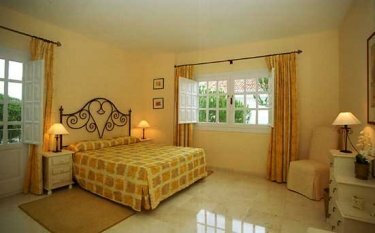 The apartment is automatically heated and air conditioned, flooring is marble with rugs throughout, and furnishings and equipment are to a high standard. There is a good quality sofa bed for additional sleeping, so the apartment sleeps six.